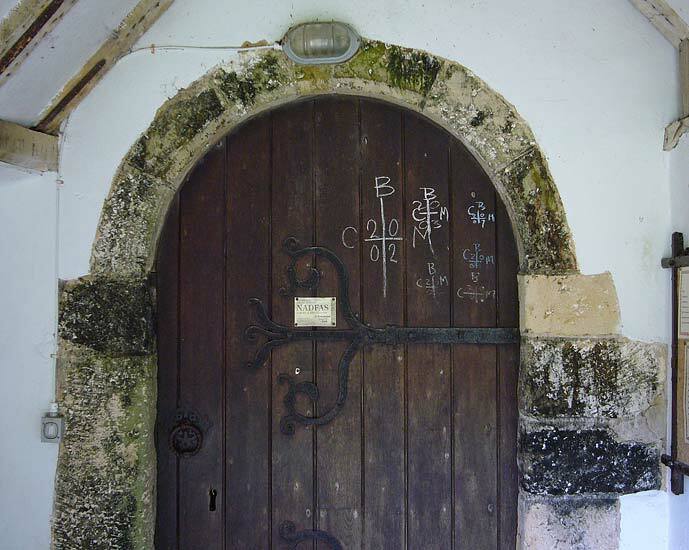 and from a diagram displayed inside the church. 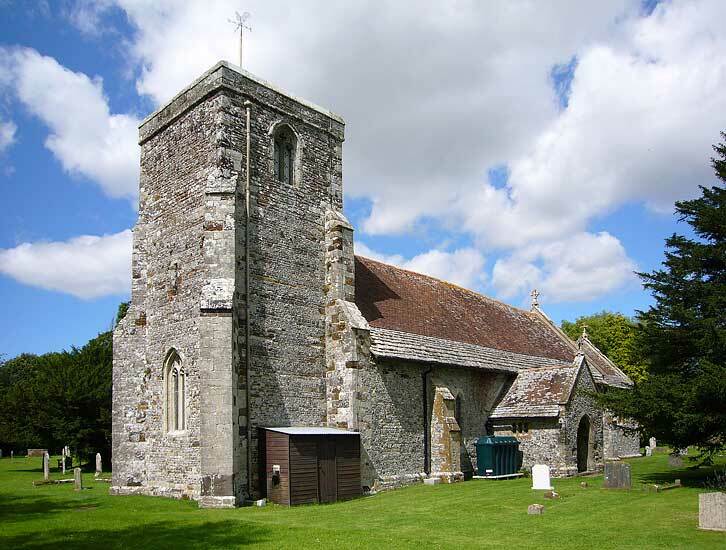 Externally the appearance of St Bartholomew's in Shapwick is that of a 14th century church in the Decorated style, but it has Norman 12th century origins still visible. 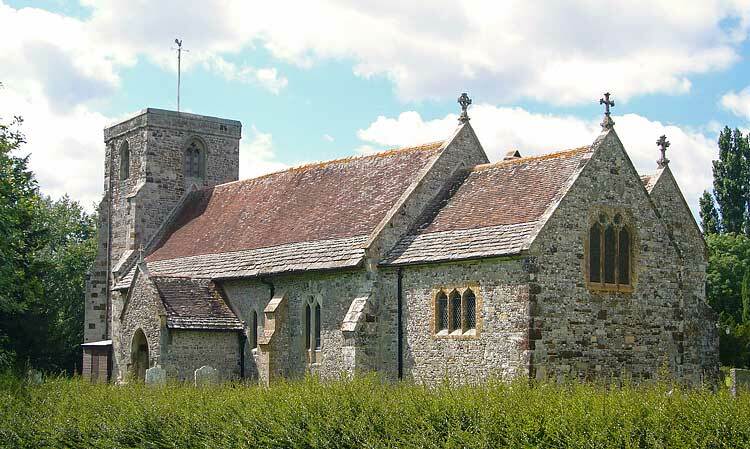 The church is built of flint and stone, the tower being 14th century but with 15th century (Perpendicular) windows. 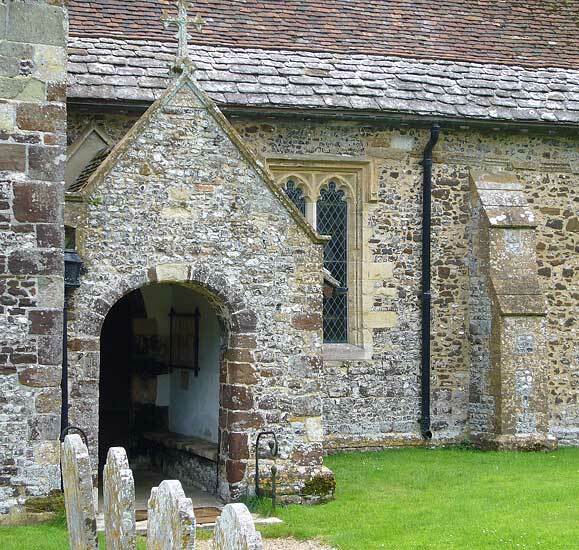 The south wall of the nave and the porch are 14th century. 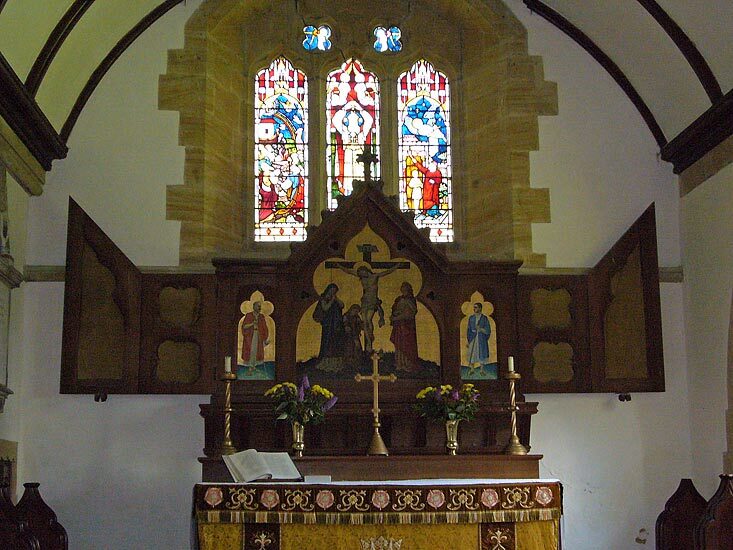 The chancel is Victorian, but with windows in the same early 14th century Decorated style of those in the nave. 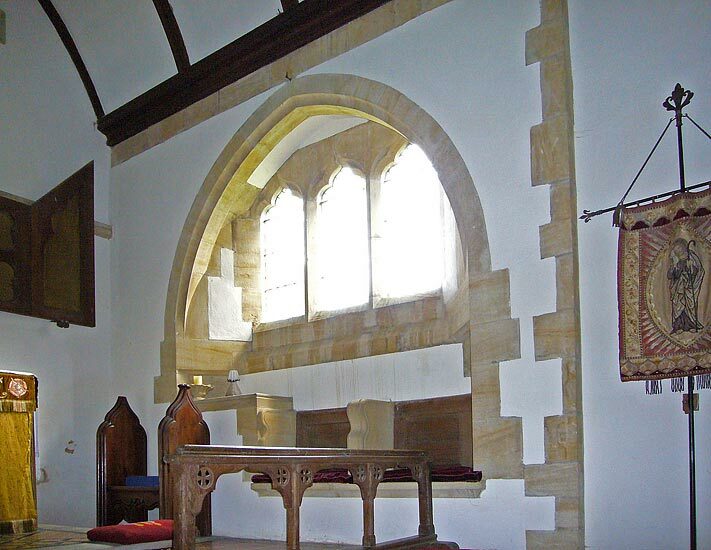 The first picture shows the east end of the Victorian chancel and the Perpendicular north chapel. 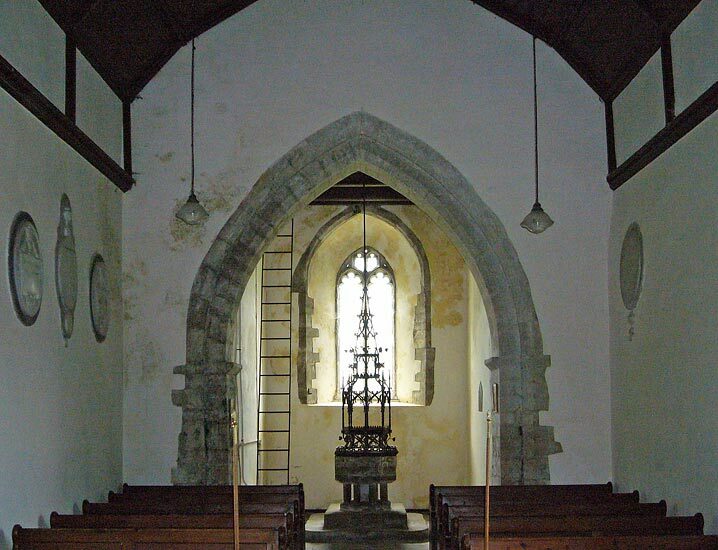 The north chapel is 16th century at its eastern end and has windows with uncusped tracery (first and second picture). 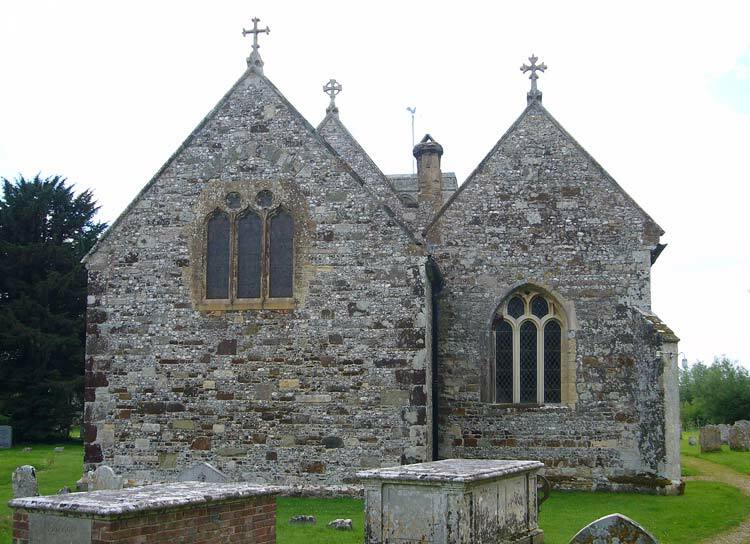 The rest is 14th or 15th century, with cusped tracery in the window. 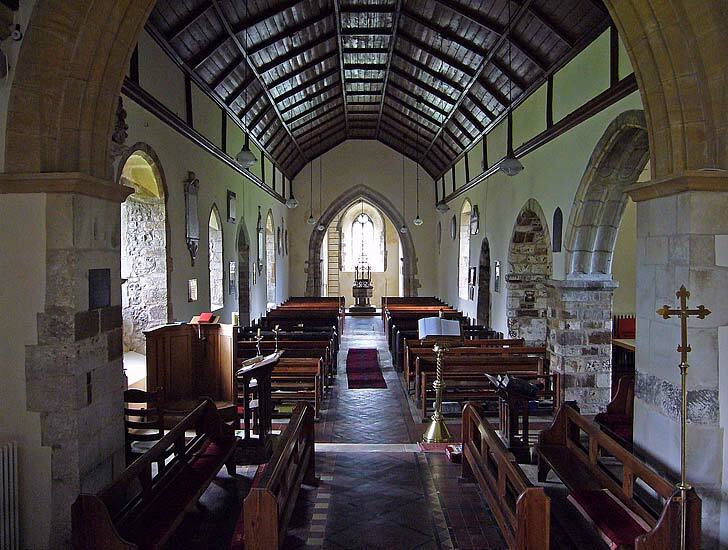 Then follows the north porch and north wall of the nave. 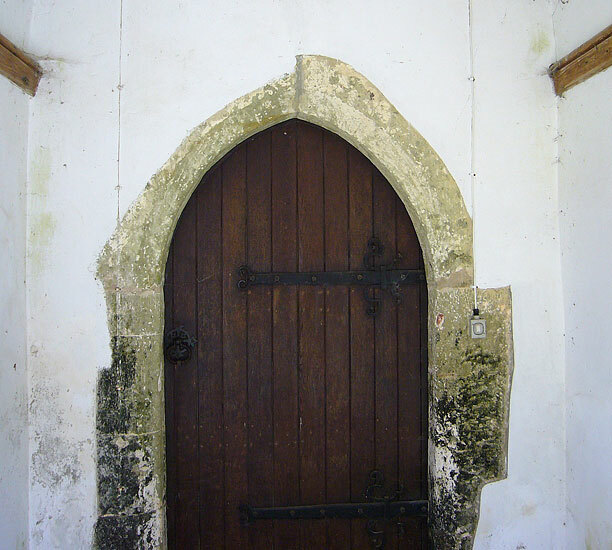 The north wall of the nave is basically Norman, as is most clearly seen by the plain Norman doorway inside the 16th century porch. 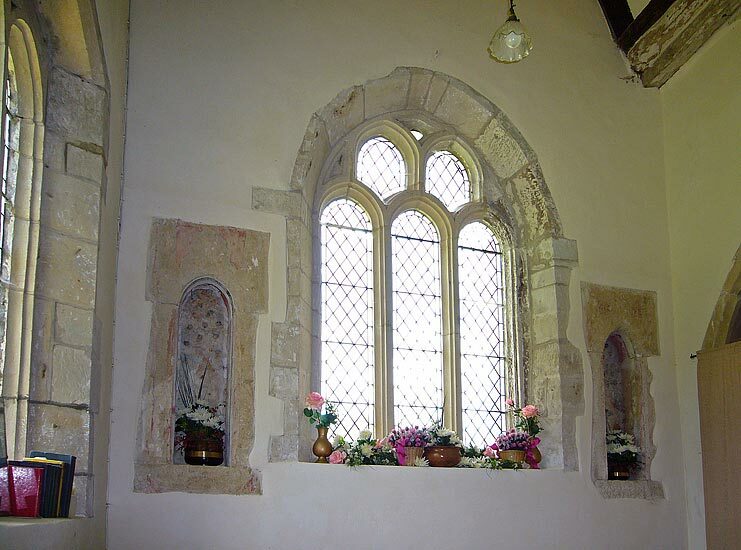 15th century Tudor window in the nave and 19th century Victorian buttress. 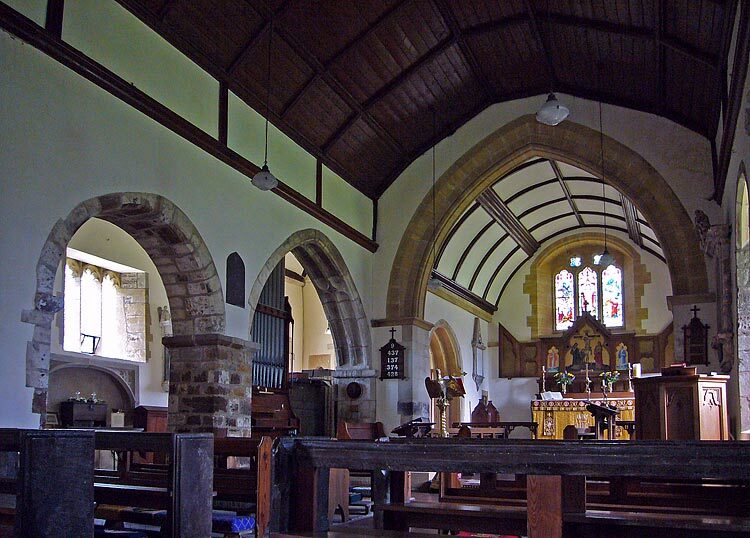 Looking east through the nave and into the Victorian chancel. 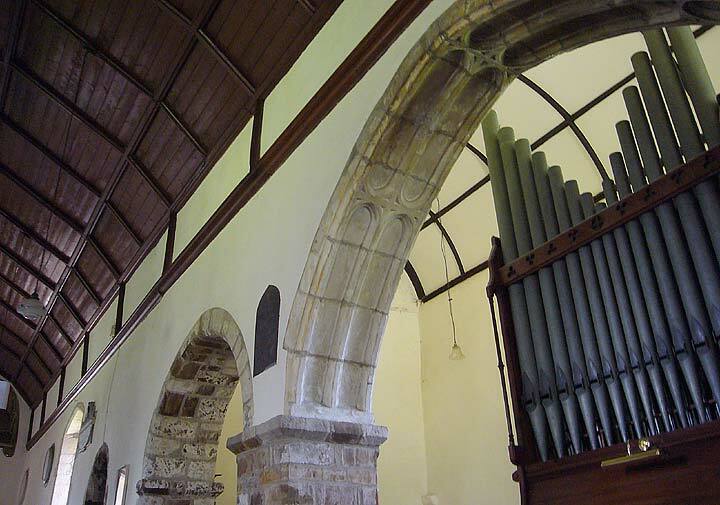 The north arcade has a simple Norman round arch with one slight chamfer from the middle of the 12th century. 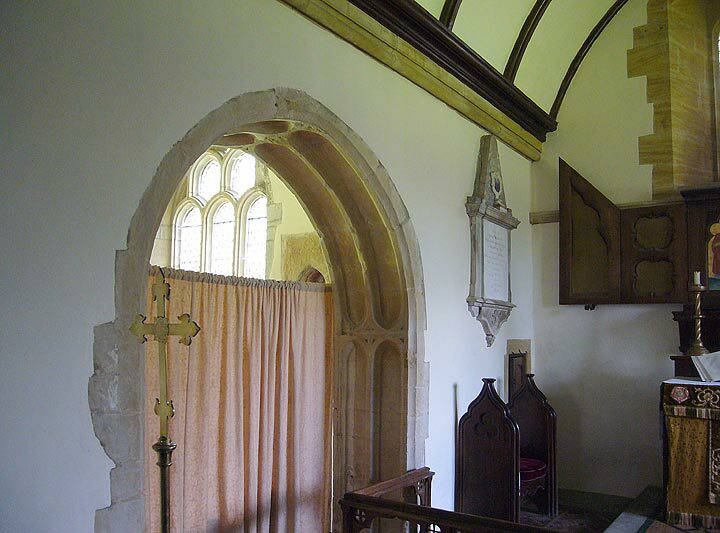 The next bay was later widened and given a panelled arch, a Perpendicular feature of the 15th century. 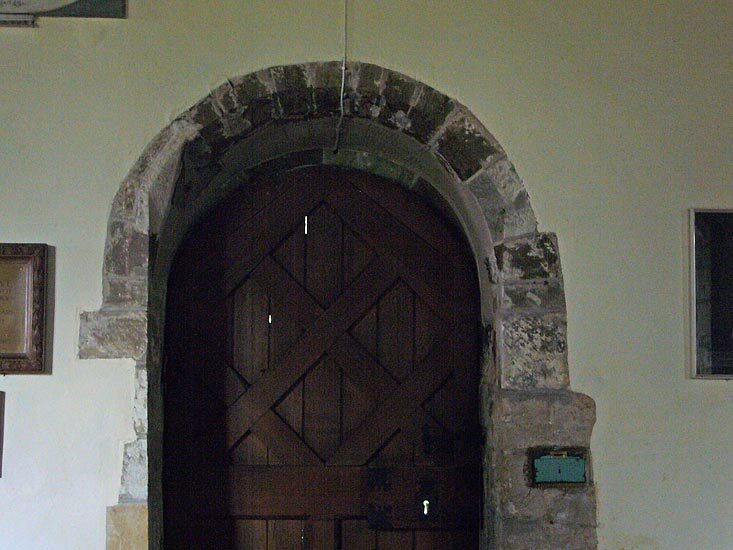 The Norman door in the north wall of the nave - A different view of the two arches mentioned above - A panelled arch also leads from the chancel into the N chapel - In the north chapel, the east window with uncusped tracery of the 16th century. 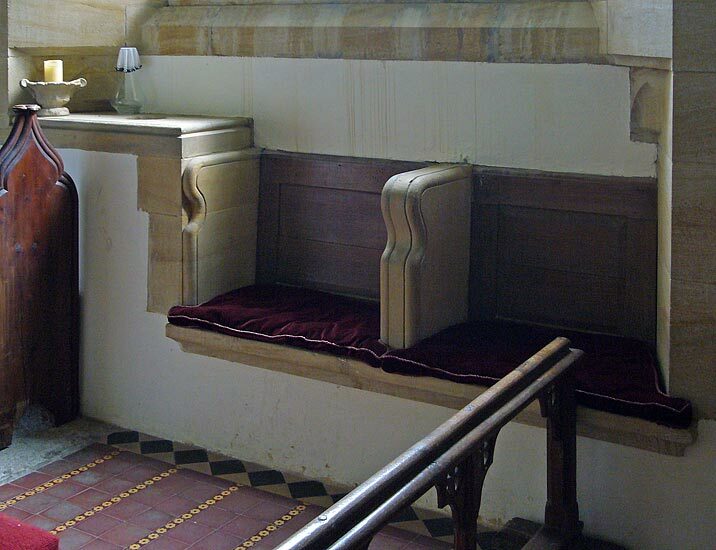 Detail from the Victorian chancel. 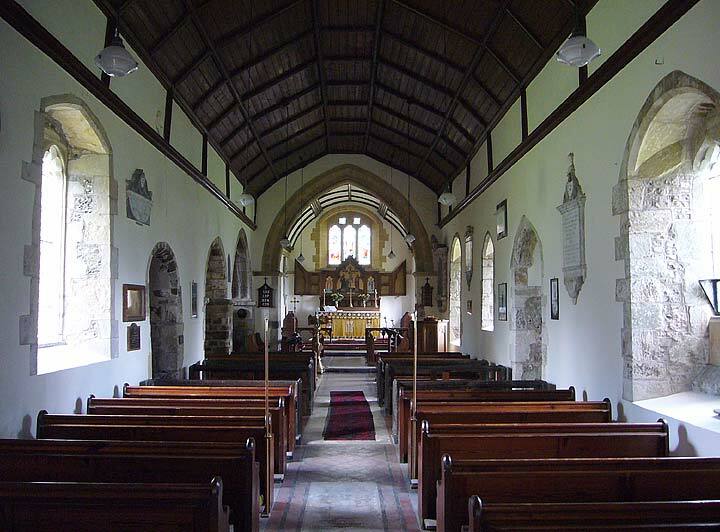 Looking west from the chancel. 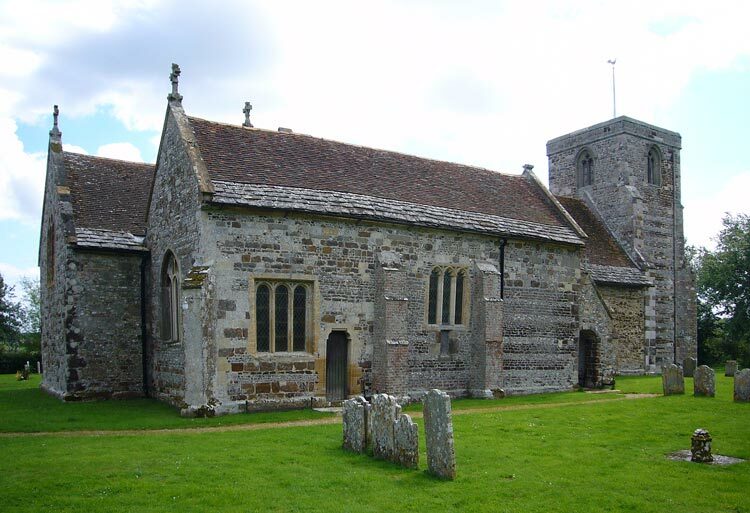 The tower arch looks 1300 at the latest, according to Pevsner. 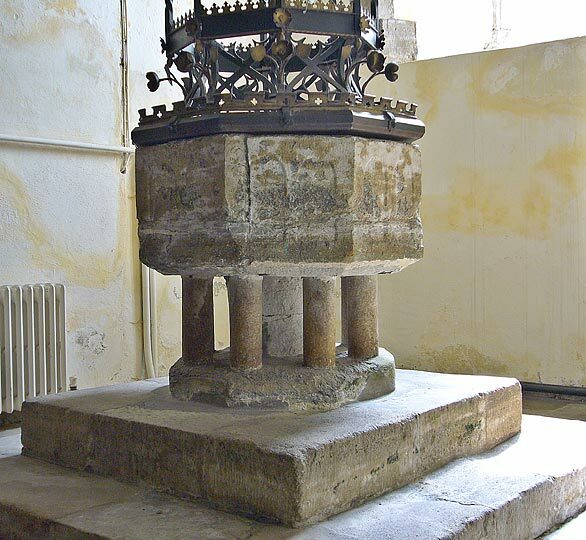 In the tower, the font which Pevsner describes as: Big, Perp, hexagonal, of Purbeck marble, with two blank arches each side. 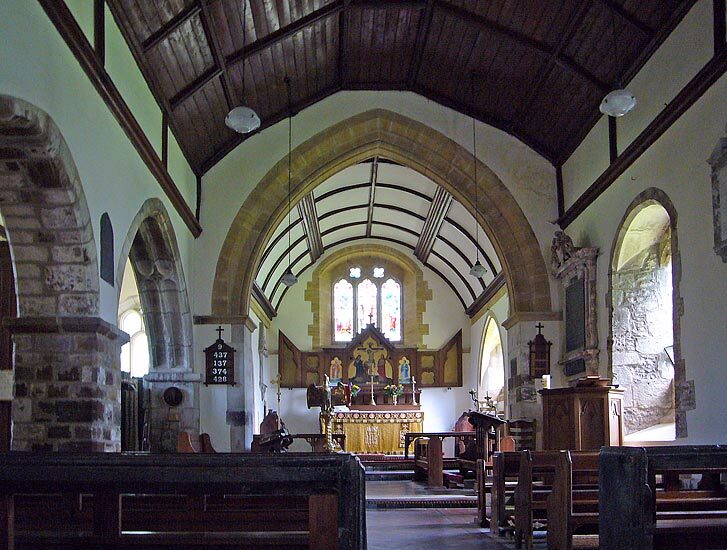 Late C12. 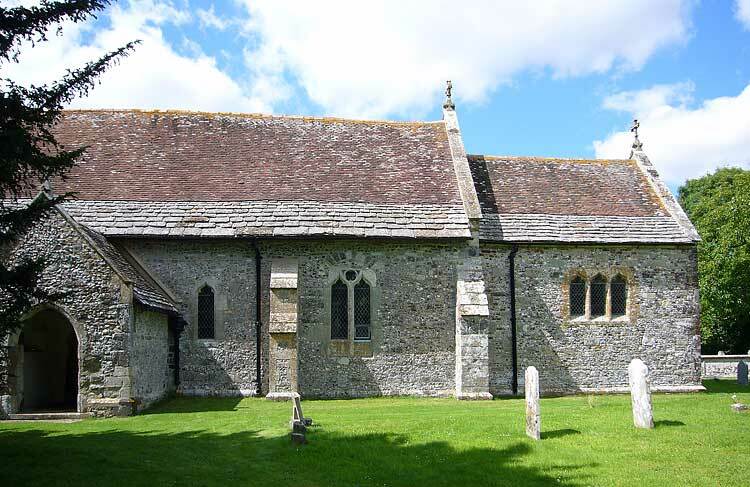 Describing it as Perpendicular must be a mistake, since that style was 200 years later than the late 12th century. 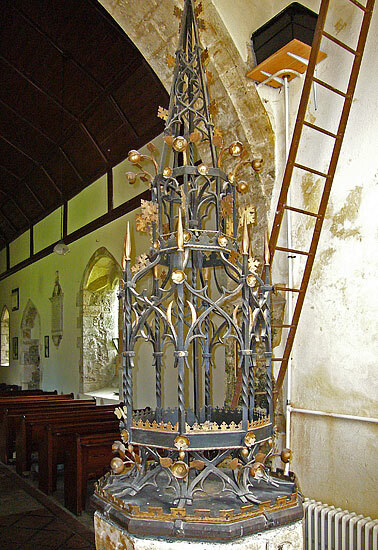 Pevsner on the font cover: Of iron, exuberant, probably c.1870 or so. 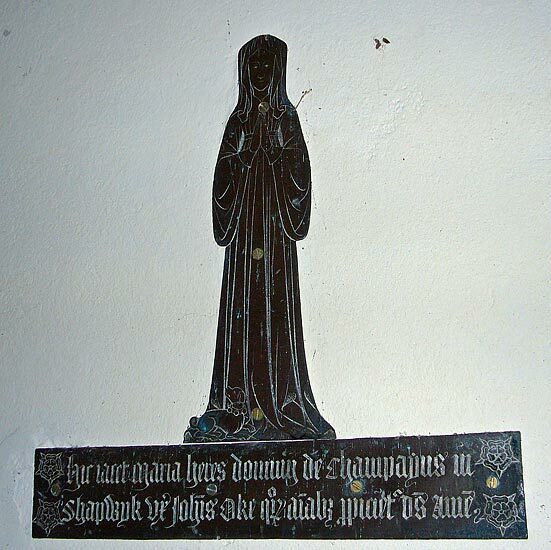 In the north aisle there is a 14 inch memorial brass figure of about 1440 to Mary Oke.